Powers/Abilities: The Astronomer is extremely intelligent. He has virtually complete knowledge of all matter in space, especially the positions, dimensions, distribution, motion, composition, energy, origins, and evolution of celestial bodies and phenomena. Additionally, he can conceive of and mastermind extremely complex plots, often on a galactic scale. The Astronomer is unaging, his life force bolstered by his single-minded obsession with the pursuit of astronomy. Along with the other Elders of the Universe, Gallio was, for a time, permanently barred from entry into Death's realm, making him essentially unable to die (at least within Earth's universe). The Astronomer has no other known superhuman physical abilities. He was believed to be of comparable strength to a middle aged human male of his size who engaged in no regular exercise. The Astonomer can project laser beams from his hands that he uses to measure the distance between planets; he can also use these for destructive purposes. This appears to be technologically derived, though perhaps the weapons are cybernetic implants, or something like that. The extent and power of his laser ability is unrevealed, but it could at least temporarily match a blast from the Silver Surfer. The Astronomer wears a lens device over his right eye that grants his telescopic vision, enabling him to see vast distances; the extent of this ability and associated limitations is unrevealed. (Captain America Annual#6 - BTS / Official Handbook of the Marvel Universe I#4: Elders of the Universe entry (fb) / Silver Surfer III#6 (fb) - BTS / Official Handbook of the Marvel Universe Update '89: Astronomer entry) - Seginn Gallo is one of the Elders of the Universe: Coming into existence approximately 5.5 billion years ago, he is one of the oldest living beings in the universe and was a member of one of the first races to become sentient in the wake of the Big Bang, the event that began the universe. (Official Handbook of the Marvel Universe I#4: Elders of the Universe entry (fb) / Official Handbook of the Marvel Universe Update '89: Astronomer entry) - Gallio's origins are lost in antiquity, but he spent his life engaged in single-minded pursuit and recording of astronomy, exploring and charting the universe and studying its stars, planets, and other heavenly bodies. His monomaniacal obsession apparently enabled him to survive indefinitely, while the rest of his race became extinct. (Silver Surfer III#6 (fb) - BTS) - Between 5.5 and 4.5 billion years ago, another Elder, the Obliterator, located each of the other Elders of the Universe, including Gallio, who had come to be known as the Astronomer. (Silver Surfer III#6 (fb) - BTS / Silver Surfer III#1_ (fb) - BTS / Official Handbook of the Marvel Universe Update '89: Astronomer entry) - The Elders chafed under the idea that there was a non-mystical, non-purely-abstract being older than them: the immensely powerful planet-destroyer Galactus, who had survived the destruction of the previous universe and been reborn in the Big Bang of the subsequent/current universe. (Silver Surfer III#15 (fb) - BTS) - Soon after Galactus empowered the Silver Surfer, the Astronomer became impressed with the Surfer's tracking abilities. (Silver Surfer III#4 (fb) - BTS / Silver Surfer III#6 (fb) - BTS / Silver Surfer III#7 (fb) - BTS / Official Handbook of the Marvel Universe Update '89: Astronomer entry) - Apparently working with the Grandmaster, the Astonomer conceived a plot to destroy Galactus, convincing fellow Elders Champion, Collector, Contemplator (actually a Skrull imposter), Gardener, Grandmaster, Obliterator, Possessor, Runner, and Trader that -- since Galactus served in maintaining the balance between Eternity, the cosmos' embodiment of existence and time; and Death, the embodiment of non-existence (this should more appropriately be the embodiment of mortality, as Oblivion is the embodiment of non-existence) -- Galactus' demise would alter the balance of and thusly bring about the end of the universe and lead to the development of a new universe. To avoid perishing in the universe's end, the Astronomer conceived a plot by which the Elders might become not only unaging, but also unable to die. He further conceived that by assembling the six known Infinity Gems (at the time largely known as the Soul Gems due to misunderstanding of their true natures), the Elders could slay Galactus. Via the gems' power, they planned to fatally siphon Galactus' biospheric energy (which he had obtained by draining the life from other planets) into six other planets. When the new universe would arise, the Astonomer believed that not only would they be the oldest beings in existence, but that they would be reborn as a race of "Galacti," Galactus-like beings, and be a dominant power in the universe. (Silver Surfer III#7 (fb) - BTS) - While five of the Infinity Gems (not including the true Soul Gem) were believed to have been destroyed when Thanos siphoned their powers into his synthetic soul gem, which had been subsequently destroyed (Avengers Annual#7), the Astronomer appreciated that the Infinity Gems could not be destroyed; instead, they had been hurled through hyperspace at the instant of the synthetic gem's destruction. (Silver Surfer III#1 (fb) - BTS) - Presumably as part of the above plot, the Champion was sent to assault the Silver Surfer on Earth allegedly to prevent the Surfer's escape, leading the Surfer to find the means to escape Earth and inadvertently assist the Elders' collection of the Infinity Gem of Mind (see comments). (Avengers Annual#16 - BTS) - The Grandmaster's and Collector's machinations with Death rendered the Elders of the Universe exiled from the realm of death, which made them essentially unable to die. (Silver Surfer III#3 - BTS) - The Surfer confronted the Collector, questioning the two recent plots involving the Elders. The Collector claimed to have been solely seeking his wife's resurrection, which didn't work out, and to have no knowledge of the Champion. However, when the Surfer left, the Collector alerted the Champion, who warned the other Elders of the Surfer's involvement. This conversation was observed by a sentient plant in the Collector's collection...who apparently passed the information on to Mantis. The Runner subsequently confronted and defeated the Surfer and left him for dead; the Surfer was recovered by Mantis. (Silver Surfer III#4 (fb) - BTS) - The Possessor gathered with several other Elders (Astronomer, Champion, Collector, Contemplator (actually a Skrull imposter), Gardener, Grandmaster, Obliterator, Runner, Trader), using Ego the Living Planet as their meeting place. They formed an alliance with the powerful Ego by rationalizing that his nature as a unique being made him the last of his kind and thus an Elder. (Silver Surfer III#4) - Mantis joined forced with the Silver Surfer to oppose the Elders' plans. They traveled to the planet on which the Elders held their meeting (unbeknownst to them, this was actually Ego), where the Grandmaster revealed how he had rendered the Elders immortal. The Grandmaster then revealed his and the Astronomers plot, the death of Galactus, which would make the Elders the oldest living beings in existence. Ego then detected the Surfer and Mantis' presence, and Ego and several Elders (not including the Astronomer) attacked them, but the pair escaped. (Silver Surfer III#7 (fb) - BTS) - The Contemplator (imposter) was sent to meet with the Supreme Intelligence to negotiate for the Mind Gem. (Silver Surfer III#7 (fb) - BTS) - By defeating the ablest sentients of the planet Grinx, the Champion obtained their world trophy, another Infinity Gem. (Silver Surfer III#7 (fb) - BTS) - The Trader traded for two Infinity Gems. (Silver Surfer III#7 (fb) - BTS) - The Elders planned to next gather on Earth, as Galactus had sworn to never return there. They further arranged to meet in a tropical area lush with plant-life, knowing that this would allow the then plant-powered Mantis to travel there as well, and that the Gardener's superior control over plants would allow him to capture her. (Silver Surfer III#5 - BTS) - The Obliterator tracked and assaulted the Surfer and Mantis, and eventually destroyed Mantis' form (though she transferred herself into the local plant life an soon formed a new body), but when he threatened to overpower the Surfer, the Surfer transformed the Obliterator's weapons, so that they projected only harmless light (at the same time disabling his transportation devices). Deprived of his ability to carry out his reason to live -- killing others -- but unable to die due to the Grandmaster's arrangements, the Obliterator agreed to share everything he knew, so that the Surfer might consign the Grandmaster to the same fate. (Silver Surfer III#6 - BTS) - The Obliterator told the Surfer and Mantis of the place (Earth) and time (autumnal equinox) of the Elders' next planned meeting. During this meeting, they were to test the weapon they would use against Galactus. However, the Surfer soon learned of a Kree threat against Zenn-La, and so he honored his pledge to defend Zenn-La, leaving Mantis to return to Earth alone. (Silver Surfer III#7 (fb) - BTS) - The Elders (Astronomer, Champion, Collector, Gardener, Grandmaster, Possessor, Runner, Trader) regathered on Earth as planned. (Silver Surfer III#7) - The Elders discussed their absent members and their reasons; Astronomer noted how the Obliterator had sought the Surfer and Mantis for them. They then discussed how they might slay Galactus via the six main Infinity Gems. They discussed having five Infinity Gems so far, and the Astronomer noted that as soon as the "Contemplator" obtained the Mind Gem, ultimate victory would be theirs. As planned, the Gardener discovered Mantis spying on them and captured her, though she had time enough to send out a plea for help to Shalla-Bal (the Surfer's former lover and ruler of the planet Zenn-La). (Silver Surfer III#7 - BTS) - Apparently unaware of the Contemplator's presence, the Surfer met with the Supreme Intelligence, asking him/it to exclude Zenn-La from the Kree-Skrull war, which the Supreme Intelligence approved. However, the Supreme Intelligence refused the Surfer's second request to exclude Earth, and when the Surfer threatened him/it, the Supreme Intelligence used the Mind Gem (referred to as one of the generic "Soul Gems") to steal the Surfer's mind and absorb it into him/itself. Explaining that it needed the "soul gem" to maintain its sanity due to the conflict between the blue and pink Kree minds that it had absorbed, the Supreme Intelligence refused to give the gem to the "Contemplator." (Silver Surfer III#8 - BTS) - The Surfer eventually freed his mind from the Supreme Intelligence and stole the Mind Gem, leaving the Supreme Intelligence incapacitated by the opposing blue and pink Kree minds within it. Meanwhile Shalla-Bal tried to contact Mantis via the plants on Zenn-La, but instead the Gardener intercepted the message and confronted Shalla. (Silver Surfer III#9 (fb) - BTS) - The Gardener captured Shalla-Bal and brought her to join Mantis as their prisoner near the Cone Nebula where the other Elders (Astronomer, Champion, Collector, Gardener, Grandmaster, Possessor, Runner, Trader, and the astral self of the "Contemplator"), had gathered to ambush Galactus. (Silver Surfer III#9) - The Contemplator told the Elders of the Surfer holding the Mind Gem, and the fate of the Supreme Intelligence. (Silver Surfer III#9 - BTS) - The Gardener's astral self appeared to the Surfer, informing him they had both Shalla-Bal and Mantis and telling him to meet them in the Cone Nebula and give them the last "soul gem" or the women would perish. (Silver Surfer III#9) - When the Surfer arrived, the Elders coerced him to release the Mind Gem to save Shalla-Bal and Mantis, then sent them to a distant place where their containment would detonate on his approach, but his power and speed enabled the Surfer to escape destruction and save one of the women (Shalla-Bal, though he had tried to save Mantis). (Silver Surfer III#9 - BTS) - Via a flare duplicating the flare used by Nova (Frankie Raye) to summon Galactus, the Elders summoned Galactus to their base. (Silver Surfer III#9) - After Nova arrived to investigate, the Elders used the six Infinity Gems to siphon his powers into six nearby worlds. When Nova tried to stop them, the Elders used the gems' power to contain her within an energy beam. Returning, the Surfer freed Nova and then guided her to cause the six planets' sun to go nova, disrupting the transfer, and creating a black hole towards which the Elders, Infinity Gems, and Nova and the Surfer were pulled. (Silver Surfer III#9 / Silver Surfer III#10 (fb) - BTS / Silver Surfer III#11 (fb) - BTS) - Restored by the nova explosion's energies, Galactus saved the Surfer and Nova -- as well as Champion, Collector, Gardener, Grandmaster, and Runner -- from the black hole. Possessor, Astronomer, and Trader, as well as the Infinity Gems, were lost into the black hole. Present only in astral form, the Contemplator escaped the other Elders' fates. (Silver Surfer III#10 - BTS) - Despite the Grandmaster's assertions that they could not die, the vengeful Galactus converted the Champion, Collector, Gardener, Grandmaster, and Runner into energy and consumed them. He did subsequently note that their energies were difficult to absorb, but considered that he had all Eternity to do so. 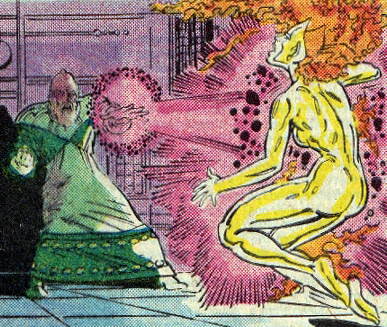 (Silver Surfer III#11 - BTS) - Nenora guided the Surfer and Nova to seek out the "Contemplator" in the Coal Sack Nebula. They tracked him down but were captured by his ally, Reptyl. (Silver Surfer III#12 - BTS) - After the Cotati guided Reptyl's aide Clumsy Foulup to free Nova, Reptyl's forces fled from Nova and the Surfer, after which Reptyl devoured much of the "Contemplator." (Silver Surfer III#13 - BTS) - The Surfer and Nova found the partially eaten, disembodied head of the "Contemplator" floating amidst the Coalsack Nebula. (Silver Surfer III#17 (fb) - BTS) - The Possessor was aware of the legends of the In-Betweener and knew they were based on fact. (Silver Surfer III#15 (fb) - BTS) - The Astronomer foresaw various events -- such as Galactus consuming and having difficulty digesting the Elders who had not been pulled into the black hole; sending the Silver Surfer to recover the Infinity Soul Gem to remove the Elders' souls to make their bodies more easily digested; the Surfer bringing others with him, who would fall under the influence of Lord Chaos and Master Order and thus be more willing to deal with the Elders; and an alliance with the In-Betweener, the surest means to traversing the black hole. The Astronomer led the Elders to plan to locate and then trade the Gems in exchange for the Silver Surfer; but then to use the Soul Gem to release the In-Betweener, who would both restore them to their realm and destroy Galactus for them. (Silver Surfer III#17 (fb)) - The Possessor, Astronomer, and Trader founded a sanctuary dedicated to the In-Betweener. They threw their voices into the void, and the In-Betweener heard and agreed to their plans. (Silver Surfer III#15 (fb)) - The three Elders found and arrived on the world of the Sinalinas, where two gems had fallen. With nothing of value to trade the Sinalinas and with Trader and Astronomer necessary for future endeavors, the Elders agreed to the Sinalinas' offer to trade them the two gems in exchange for Tharnn, whose knowledge of an alien realm interested the Sinalinas, as well as a starship and some weaponry. (Silver Surfer III#15 (fb) - BTS) - The Trader and Astronomer recovered the other four Infinity Gems. (Silver Surfer III#15 - BTS) - When the Silver Surfer (along with Mr. Fantastic/Reed Richards and the Invisible Woman/Sue Richards, who were already beginning to fall under the influence of Master Order and Lord Chaos, respectively) arrived on the world of the Sinalinas, the natives rushed out to prevent the invaders from harming or taking the Possessor, or Tale-er, whose stories they treasured. The Surfer and allies made short work of the Sinalinas, and the Possessor confirmed that the Astronomer and Trader were seeking the other four Infinity Gems, though he refused to reveal where they had gone. Able to track them, the Surfer took the Richardses with him as he departed, leaving Tharnn behind, just as planned. (Silver Surfer III#15) - Guiding the Richardses in their ship, the Surfer tracked and confronted the Trader and Astronomer in their ship, noting they had all six Infinity Gems. After the Astronomer noted his long-time appreciation of the Surfer's senses, the Trader responded that his skills were wasted, as they needed the Infinity Gems, which were attached to the Trader's biological aura by a bodycase, which could only be removed through his death...and he could not die. Affected by Lord Chaos, Sue Richards attacked savagely, dropping the Trader by forming a force field to cause his power hand-blaster weapon to backfire; stunning the Master Order-affected Mr. Fantastic by massively distending his form with a spiked shield; and confounding the Astronomer by making his arms and legs invisible. Appealing to the Trader's monomania, the chaos-driven Sue Richards (aka Malice) incapacitated the Surfer with the Trader's gun (which she had made invisible) and then traded the Surfer to the Trader for all six Infinity Gems. (Silver Surfer III#16 (fb) - BTS) - After the departure of "Malice," the Astronomer and Trader landed their ship on an unidentified planet, bringing the captured Surfer and the Order-driven Reed Richards with them. (Silver Surfer III#16 - BTS) - The Trader taunted the Surfer with his inability to escape his bodycase or to touch his surfboard without his permission, and then told the Surfer he would fly the Astronomer and Trader back through the black hole. 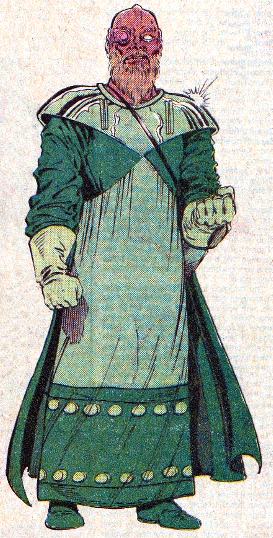 Richards noted that the Elders could not have escaped the "Magic Realm" via the Infinity Gems and that they needed the Surfer. Richards further insisted that Death's pact barring the Elders from her realm did not apply in the Magic Realm, and that they could, in fact, die here. Therefore, if they gave the Surfer access to his board to escape the realm, he could access his power and slay the Trader or both Elders. Though the Trader disputed this, the Astronomer seemingly admitted that Richards had seen through them. Richards offered to trade them his promise to free them (after rescuing Sue) in exchange for their freeing the Surfer; the Trader seemed uncertain, but the Astronomer accepted, much to the Trader's seeming consternation. The Astronomer noted that Richards was an honorable and serious man, but after they departed, the Astronomer and Trader smiled and shook hands, as the heroes had again played into their scheme. (Silver Surfer III#16 - BTS / Silver Surfer III#17 (fb) - BTS) - At some point as the Surfer tracked and led Richards to the ship Sue Richards had piloted towards the black hole, the Possessor, Astronomer, and Trader arrived and hid behind a panel aboard that ship. Reed Richards accidentally touched the Soul Gem and was briefly possessed by the In-Betweener, who subsequently emerged physically into the Magic Realm. 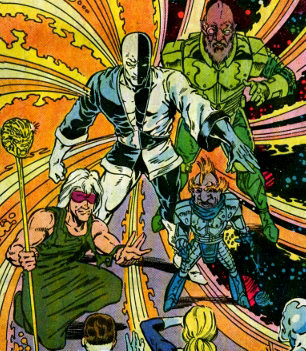 (Silver Surfer III#17) - The Possessor, Astronomer, and Trader emerged from behind their hidden panel, revealing their alliance with the In-Betweener and their plans; the Astronomer noted his pride in having been able to conceive this complicated plot. With the Elders intending to leave the Surfer and Richardses (now free from Chaos and Order's influence) trapped in the Magic Realm,.the Elders gathered the other five gems (the In-Betweener retained the Soul Gem) and departed to Earth's universe. As they approached Galactus' ship, the Punisher was unleashed and attacked the In-Betweener, who swiftly recovered and annihilated the Punisher. Upon entering Galactus' ship, the Trader used the five Infinity Gems he held to incapacitate Nova. However, the In-Betweener failed in his attempt to destroy the collapsed Galactus (as Galactus was unique in this universe and had no force with which to counterbalance him) and instead decided to cast Galactus back through the black hole. The Astronomer angrily forbade this, reminding that the other Elders were still within Galactus. The Elders fired a blast drawing on their Infinity Gems' power, but the In-Betweener was unaffected. He then summoned Death and apparently -- arguing that, as the balance point between extremes, he was death himself, as well as life -- forced her to slay the three Elders. (Silver Surfer III#17 - BTS) - The In-Betweener then banished Death as he transported Galactus' ship back into the Magic Realm. There, Reed, Sue, and the Surfer summoned Lord Chaos and Master Order and explained the In-Betweener's activities. Lord Chaos and Master Order, at the Surfer's request (in exchange for returning the In-Betweener to them) caused Galactus to disgorge the Elders within him. Reviving, Galactus insisted the In-Betweener must die. (Silver Surfer III#18 (fb) - BTS) - Lord Chaos and Master Order returned Galactus, the Surfer, the Richardses, and the Champion, Collector, Gardener, Grandmaster, and Runner to their native universe. (Silver Surfer III#18 - BTS) - Champion, Collector, Gardener, Grandmaster, and Runner observed the battle between Galactus and the In-Betweener. The Grandmaster stated, "I do not believe that childish story of Death being forced to do do anything. Death swore to refuse us forever!" He chose to risk his existence in that belief. With the Grandmaster wagering on the In-Betweener's victory and vowing to stop the others from interfering, the Champion incapacitated the Grandmaster while the other Elders added their Infinity Gems power to the Surfer's own to push the battling Galactus and In-Betweener into the realm of Lord Chaos and Master Order, where those two reclaimed the In-Betweener (still in possession of the Soul Gem) as their prisoner. The two cosmic beings then cast the others from their realm. (Silver Surfer III#19) - Champion, Collector, Gardener, Grandmaster, and Runner used their Infinity Gems to depart to elsewhere in the universe via hyperspace. (Annihilation: Ronan#3) - Astronomer, Champion, Contemplator, Grandmaster, Gunrunner, Judicator, Quantum, Runner, and Zarek showed up in the transformed Abyss on Godthab Omega. The newly arrived group witnessed the arrival of the Annihilation Wave/Swarm. (Annihilation: Ronan#4 - BTS) - The new arrivals' fates are unrevealed, though Glorian eventually wiped out the Annihilation Wave. (Contest of Champions III#6 (fb) - BTS) - Following the defeat of God Doom and the subsequent omniversal reconstruction, Astronomer and the other Elders of the Universe became aware of Battlerealm, the former, broken "Secret Wars" reality at the edge of spacetime. (Contest of Champions III#6 (fb) ) - The Elders traveled to Battlerealm and visited the husk of the old Battleworld where they still sensed an immense source of power waiting to be claimed (the recently formed ISO-8). All the Elders immediately lusted after it, ready to follow the path of their individual obsessions to claim it. Astronomer suggested to just share the power on this world, but others disagreed. In the end they all agreed to the Grandmaster's proposal of deciding through a contest of champions. All twelve of them would get to pick a champion from the new multiverse to fight in their stead, with Grandmaster already selecting Maestro (Bruce Banner) who they found alive and defiant in the ruins of Battleworld. (Contest of Champions III#6 (fb) - BTS) - Astronomer picked Iron Hulk as his champion. (Contest of Champions III#6 (fb) ) - The Elders' champions duked it out in Arcade's Killiseum arena. Grandmaster's champion made quick work of Iron Hulk and put on his armor after slaying him. Astronomer looked on in shock at his champion's quick defeat. Comments: Created by Steve Englehart, Marshall Rogers, and Joe Rubinstein. Regarding the assessment of Silver Surfer III#1: Alternatively, the Champion may have actually been part of a plot to help the Skrulls enslave Galactus, and the Surfer's defeat of the Champion and subsequent escape from Earth may have been incorporated into the Astronomer's subsequent plans. The Champion seemed to be actually seeking the Surfer's destruction in both Silver Surfer III#1 & 3, though the Astronomer could easily have considered the Champion a simpleton and not told him of the full plans at this point. I have to think the Astronomer wanted the Surfer to get the Soul Infinity Gem from the Supreme Intelligence. I further think that while this group of Elders had already gathered together, only the Grandmaster was aware of the nature of the Astronomer's plot until portions of it were revealed to the rest in Silver Surfer III#4. Due to the complexity of the plot, for which the Astronomer is credited, I have listed him as behind the scenes in all major efforts by any of the Elders up to their departure in Silver Surfer III#19. The Astronomer seemed to be legitimately outraged and surprised by the In-Betweener's plan to cast Galactus into the black hole and then to summon Death to destroy them...so presumably that's where his plan fell apart. The image to the right was a supplemental entry from the Astronomer's OHotMU Update '89 entry, which came about a year after the issue publishing the Astronomer's apparent demise. The image shows him firing a laser blast at Nova. That event didn't end of occurring in the comics. The Astronomer and Nova encountered each other twice and both times largely indirectly. In Silver Surfer III#9, the Elders collectively nailed Nova with a blast from their Infinity Gems; after the Surfer freed her, she destroyed the sun, casting the Astronomer and others into the resultant black hole. 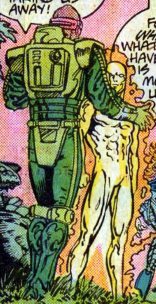 In Silver Surfer III#17, the Astronomer wore his armor, rather than tunic shown in the picture, and it was the Trader, who incapacitated Nova with a blast from the five Infinity Gems he held. Perhaps there is some, as yet unrevealed, encounter between the two...? 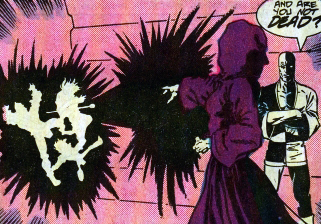 The Possessor was subsequently shown to have survived apparent obliteration at the hands of Death, as he was active again in Quasar#47 (June, 1993); so, it's entirely possible that Astronomer and/or Trader survived, too, or that their destruction at Death's hands was part of a ruse. In Silver Surfer III#7, the Runner mistakenly (or perhaps as an intentional insult) called the Astronomer "Astrologer." Also, for an extensive discussion on the nature and progression/evolution of the Elders of the Universe, please see the comments on the Possessor profile. Contest of Champions update by Norvo & Markus Raymond.